Lunch and snack provided. No children under three permitted on this tour. Explore a marvel of engineering from above and below with this unique tour. Travel to the Hoover Dam in ease and comfort inside our custom-designed Tour Trekker's. After picking you up from your hotel, our guides will share fun tidbits and stories on the way to the dam. As Certified Interpretive Guides, they’re always ready to share myths, legends and fun trivia about the area. As you near the dam, you'll drive by historic Boulder City and learn about its important role in the dam’s construction. This town was created solely to house workers during the dam’s construction and retains its vintage charm. Lake Mead, the country’s largest reservoir, can be seen as you arrive at the historic structure. 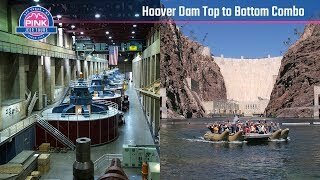 Then it’s on to the most unique element of the tour—a 90-minute float on the Colorado River for an up-close look at the dam. Take a short walk to the raft launch while your guide points out relics of the dam’s past. From the dam’s basin, you’ll get an amazing vantage point of the Mike O’Callaghan-Pat Tillman Memorial Bridge, which links Arizona and Nevada. Be sure to capture some photos of the world’s highest concrete arch bridge, and take a good look: because soon you’ll be up there and looking down. Your first stop features exhibits and presentations at the Hoover Dam Visitor Center. You’ll also take a 30 minute tour of the Power Plant while exploring passageways within the dam. Gaze down at the powerful Colorado River and take plenty of pictures. Marvel at the vastness of the reservoir and height of the towering dam wall before your relaxing return trip to Las Vegas. This tour includes lunch, a snack, parking, admission fees and complimentary bottled water. Myself and my wife had a fantastic day and we would highly recommend it. Phill was a great guide and the itinerary was excellent and great value for money. The boat trip was amazing as well and Dani the guide was brilliant. All in all a superb day out! It was awese. Phil did an amazing job and it was well worth it. Our guide was very educational and took good care of us. He really made sure we learned everything about Hoover Dam and not miss any good stuff. The ride on the Colorado River was gorgeous! I really love your tours. My son and I did two in a row. Thank you! Just disappointed in boat ride. Tour was great. There were only the 2 of us on or tour and it was fantastic. The raft ride was a highlight as was the tour of the facility by Carol. She was a fountain of knowledge and really knew her stuff. I was super impressed! The whole time I was relaxed because it was so easy to "go with the flow". Jerry did a great job with logistics and driving and touring. He was amazing! Great ride. Great activities for the price too. I loved it. Such a great time. Thanks Pink Jeep - I hope to do more with you again in the future. The tour was fantastic and interesting. James Troutman was amazing with all the fun facts and information he provided on the way to Hoover Dam. My daughter, her friend and I had a blast. I would easily take this tour again. When I return to Las Vegas next year, I'm going to take another Pink Jeep Tour! Good times people, good times! Jerry, our tour guide, was extremely friendly and made everyone feel comfortable right from the start by introducing us, asking us questions, and making us laugh. His constant narration as we drove was interesting and made the trip go quickly with no awkward silence. Everything ran smoothly, the pink jeep SUV was comfortable, and Jerry made sure to give us lots of bottled water. His details about the dam made it so much more interesting than it would have been if we hadn't done a tour. The raft ride was also fun and seeing the dam and the bridge from the water view below was beautiful. It was a week of excessive heat warning around 112 degrees that day, but Jerry kept reminding us to drink lots and he gave us frozen towels as we were learning about the dam while in the sun. The inside tour was cool to see as well and we learned a lot about the history and structure of the dam with those guides, but it was much more fun to listen to Jerry! On the way back we stopped at a small park with a great view of Lake Mead and a whole bunch of mountain sheep relaxing in the shade. It was only a few minutes, but it really made the trip special.